Jazz Joan and Cigarettes. Clare Doyle. The official guide for the Marciac Jazz festival arrived a couple of weeks ago. Here we are in a small town in the Gers department in South West France. The population is around 1,300, and it boasts a beautiful central square with covered arcades, perfect for finding shade in the summer, and avoiding the rain in the winter. Normally the town is quiet, there is a market on Wednesday, there are a couple of good restaurants, you can take a walk around the lake, it’s pleasant, it’s rural France. This all changes at the end of July. 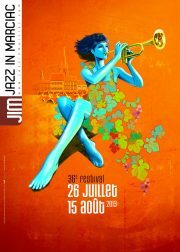 This year, from the 27th July through to the 15th August it will be the 41st Marciac Jazz festival. It all started when Jean Louis Guilhaumon arrived in Marciac to teach English at the College. A lover of Jazz, he invited some of his musician friends from Paris to come to the South West to enjoy the calm and to play music. It all started in the garage of a local resident, and grew from there, and how it has grown! This year around 200,000 visitors are expected to descend upon the village, it sounds impossible, but it works! A huge marquee, the Chapiteau, goes up on the rugby pitch, seating 5,000 for the major concerts, the main square becomes an open air space for the all day free concerts, stalls and restaurants pop up in the surrounding streets. Marciac lives for music, for fun. There is also the Astrada, the state of the art concert hall which opened in 2011, seating 500, and there are workshops and master classes. Just looking at the programme, and seeing that there are at least two performances every night in the Chapiteau and the Astrada, a rough calculation gives you a figure of around 78 artists to choose from during the official festival, and that’s not counting the free concerts, and the many musicians who play in the restaurants or the street. The big name this year is Joan Baez. She is to play the final concert. As soon as the programme was announced, her gig was sold out! It took me back to Dublin in the 60s. Silence, then an astonished chatter ‘Wha’? and ultimately, the sound of butts being put out in the ash trays. After all, you’d paid to see the woman sing, one song wasn’t going to cut it. She resumed the programme, she was great, the smoke gradually wafted away, the applause was generous, but perhaps not as enthusiastic as it was at the beginning. Telling a Dublin audience off was courageous, but not necessarily popular. After that concert, my enthusiasm for her changed. Somehow that wonderfully clear strong voice sounded more hectoring, schoolmarmish, like she was bossing me around, making me listen to what she wanted to say, rather than involving me. I lost interest, and there were many others who could fill the space. I had hardly heard of her for years, and to see the immediate effect in Marciac was startling. One of the advantages of the Chapiteau is that even if the place is filled, you can hang around outside the marquee, sit on the grass, drink a glass of wine, and still hear the concert. For old times’ sake I may well go, and I’ll be sure to take some cigarettes!